This breed has deep burgundy medium thick hair which is often long and curly during the winter with a creamy white switch on its tail. 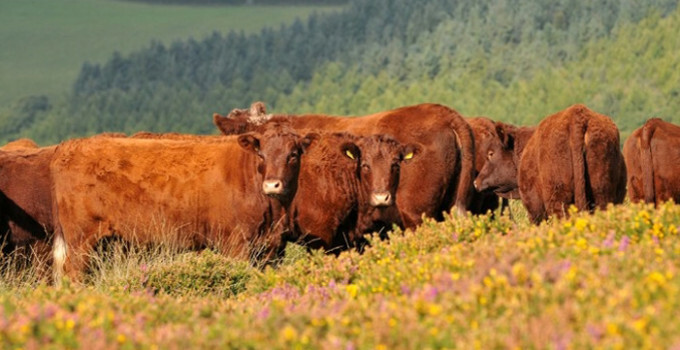 Devon Red Ruby cattle require little supplementary feeding and are ideally suited to grazing on land that has conservation value. Docile by nature and compact in size, the Red Ruby is an efficient grazer causing minimum damage to the land. This breed is able to naturally lay down intramuscular fat within the meat, providing excellent marbling. The resulting tender beef is prized and well recognised internationally. The native home of the breed is the South West of England, in particular Devon. History records that the Romans took interest in the red cattle when they occupied this area in 55 BC. The origins of the Devon Red Ruby are thought to be linked to the Longifrons and Urus cattle. There is also evidence suggesting that the seagoing Phoenicians may have brought some ancestral red stock from Northern Africa or the Middle East to South West England. Some animal breeders speculate that this may explain the Devon Red Ruby’s remarkable ability to adapt to hot climates. Having fallen out of favour in modern times due to an increased demand for faster growing continental breeds, such as the Belgian Blue, the Devon Cattle Breeders Society now reports a constantly growing interest in native breeds within commercial farming. Even though it is still true, that you will not find wonderful grass – fed Red Ruby Devon beef in your high street supermarket, it can be bought from quality butchers and farmers directly if you make a little extra effort. Maybe you will even come across it on the menu of gastro-pubs or top class restaurants, which both value the high quality of the product. The rising demand for slow – grown grass fed beef has helped lead a renaissance in the breed, so whilst still being a niche product, it is there if you look. For more information please visit our and the society’s producer section.